My agency has a program that requires that clients have a script for service on file in order for services to be billable. Since a script for service requires a diagnosis, we configured the program’s services to require an active diagnosis in order to generate a claim. As a result, we have client diagnoses expiring on the same date as the script for service. When a client gets a new script for service, the same diagnosis is re-entered with a new start and end date. After a few years enrolled in this program, a client’s diagnosis screen begins to get cluttered with inactive diagnoses so our clinicians asked for a way to just see the current diagnoses that were on file rather than all of the diagnoses that had been entered for the client over the years. myEvolv includes as “Diagnosis – Active” formset member that looks like it was created to serve exactly this function but it would not list any diagnoses that have end dates on them (even future end dates). Our program’s diagnoses are entered with end dates since we need them to expire at the same time as the script for service. We were able to get what we wanted by creating a custom formset that uses a custom default form with a modified list condition. I have outlined the steps we took to accomplish this for our specific scenario but you could apply this in other situations where you want to customize the listing in a formset member. 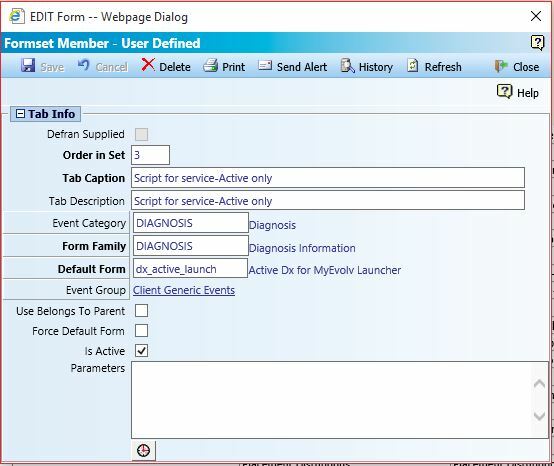 myEvolv’s Active Diagnosis formset member used the “Diagnosis form for listing – active only” form as its default form so we used it as the basis for our new form. In the form designer, open the “Diagnosis Information” form family. The List Condition property allows you to use SQL statements to manipulate the data that will be listed on the formset member. Anything you put in the list condition property will be executed as though it is part of the “WHERE” clause on a SQL query. In the code above, you can see that myEvolv’s list condition was designed to only list diagnoses that have no end_date and have not been deleted. I used SQL’s GETDATE() function to get today’s date so now in order for the diagnosis to list, it must either have no end_date or an end_date that is greater than today’s date and not have been deleted. We now need a place to apply the new form we created in myEvolv so that it can be used. We could just swap put the form for the myEvolv-supplied active diagnosis formset member but since other programs might be using it, we decided to create a custom formset member that was only visible to the clinicians in this program. Our clinicians use myEvolv Launcher as their home pages in myEvolv. They are used to clicking on their clients from the My Client’s widget, which launches the My Client Information standalone formset so that is where we wanted to add our custom formset. Create a New “Formset Member – User Defined”. You can give the tab any caption or description you would like. 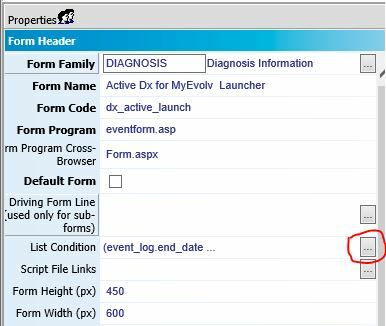 Because we are working with the Diagnoses, we have to pick “Diagnosis” for the Event Category that will allow us to pick the “Diagnosis Information” form family and our default form, “Active Dx for MyEvolv Launcher”. NB: Once this is setup, remember to give users access to the new form in the Navigation Access Setup. In this example, the new formset member is listed in the My Evolv Module -> My Client Information section. The screenshots below were taken on 7/11/2016 so active diagnoses would be those that have no end date or an and date after 7/11/2016. This is the generic “Diagnosis Information” formset member. It is showing all of the diagnoses (except those that have been deleted) for the client. You can see that the first two would be active by our program’s definition since we have one with a future end date and one with no end date. The other three are expired diagnoses and those are the ones that we do not wish to display in our custom formset member. This is myEvolv’s “Diagnosis – Active” formset member. It is only listing the active diagnosis that has no end date. This is our “Script for Service – Active Only” formset member. Both active diagnoses are listed. Success! List Condition Overwrite on Upgrade? We have noticed that the list condition on this formset member has been overwritten after upgrading our system. We have a support case about the phenomenon and hopefully it will be resolved in a future release but until then, beware and be sure to save a backup of your custom list condition code to re-apply after upgrades.